AvatarMeet 2012 photos and video posted. 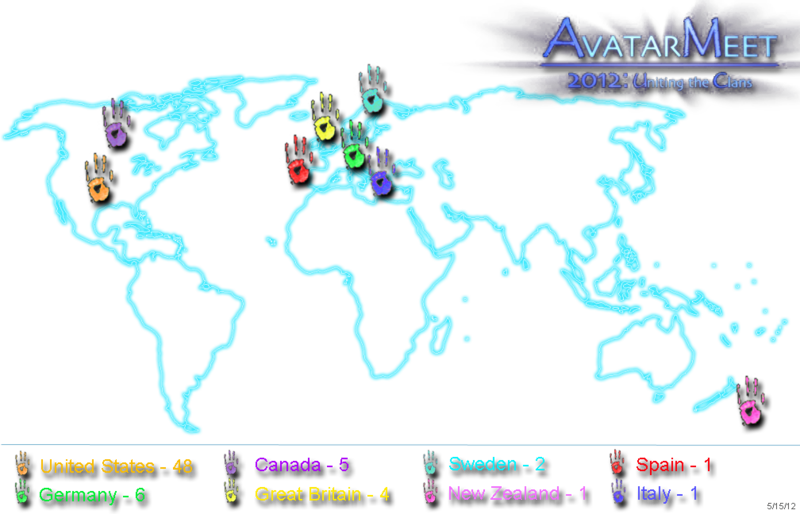 AvatarMeet 2012 was a huge success, and we can't thank everyone who participated enough for making the event what it was. Check out the Photo Gallery and Video Logs links to the left to see photos and video from the event. Earlier postings on this page remain below for archival purposes. We hope to see everyone at AvatarMeet 2013! We have secured a fantastic deal with the EMP museum for group tickets for AvatarMeet 2012. Access to the EMP Museum, Na'vi Lessons, Meet the Producer event with Jon Landau, and our very own private screening of Avatar in the JBL Theater; all for just $30! EMP tickets are on sale now HERE! We are thrilled to announce that Academy Award winner Jon Landau, producer of "Avatar" (and some other little films like "Titanic"), will be joining us at AvatarMeet 2012 for a "meet the producer" session on Friday evening at the EMP's JBL Theater, before our special private screening of Avatar. Karyu Pawl to teach Na’vi lessons at AvatarMeet 2012! We are very excited to announce that linguist Professor Paul Frommer, creator of the Na''vi language, will be joining us for AvatarMeet 2012! As part of the event, Paul will be co-teaching a series of Na''vi language workshops with Txonä Rolyu, Prrton, and ‘Oma Tirea; open to all registered attendees who are interested in learning the Na''vi language from the masters themselves. The interactive workshops are designed as a beginner’s introduction to the language, but are open to Na''vi speakers of all levels. No prior knowledge of Na’vi is necessary, but if you want to get a jump start on the language, check out the myriad of resources over at LearnNavi.org. To sign up to attend the Na''vi lesson, simply edit your AvatarMeet.com profile and answer "yes" to "Are you attending the Na''vi language class at Avatar Meet 2012?". You will show as signed up on the Roll Call list and you''ll know you have your space reserved for this exciting opportunity! Space may be limited, so sign up today! Time running out to book for AvatarMeet 2012! AvatarMeet 2012 will take place in Seattle Washington July 19th - 23rd. Check out the Event Calendar for for a more detailed schedule of events! You can now create an account and register for AvatarMeet 2012 and various events and options, all right here only on AvatarMeet.com! The group hotel for the 2012 meetup is the Best Western Executive Inn. Instructions on how to book are in Attendee Info. Several events need payments in advance. Please go here for more info. Be sure to sign up for the newsletter HERE for all the latest news and updates!